Today Supervisory Board of RB Rail AS appointed Timo Riihimäki as Chief Executive Officer and Chairperson of the Management Board of the Rail Baltica Joint Venture. He will start his duties from 11 March 2019 and will be based in Riga, spokesperson for RB Rail AS said. 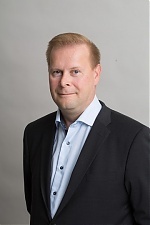 Timo Riihimaki has worked in several management positions at NRC Group A/S, the former VR Track Oy, leading Finnish railway engineering, construction and maintenance company, latest as member of the management board and vice president of material services and track machinery. "Supervisory board welcomes Timo Riihimaki to this key position of the Rail Baltic project," said Karolis Sankovski, chairman of RB Rail AS Supervisory Board. "He has broad international and domestic knowledge in railway infrastructure construction, maintenance services and railway heavy machinery operations. In addition, he is experienced in corporate and business turnaround strategies and management of international companies and organizations," Sankovski said. He said that as for the present priorities, RB Rail shareholders and supervisory board expects Riihimaki to strive for timely implementation of the detailed technical design phase on different sections of the Rail Baltic railway, and trust that thanks to his personal and RB Rail team's involvement and devotion the project will continue to accelerate. Riihimaki said it was a privilege to accept the challenge to coordinate the Rail Baltica Global Project. "Economic and social importance of Rail Baltic as well as its scale makes it one of the most complex and at the same time interesting projects in Europe to be involved in," Riihimaki said. "Rail Baltic will positively impact lives of millions of people and it is important to implement this project within the budget and on time." Prior to VR Track Oy, Timo Riihimaki had a long career in leading positions at Finnair Group. He holds an MBA degree from the Henley Management College at the University of Reading in the UK as well as diploma in marketing from the Institute of Marketing in Finland. The previous CEO of RB Rail AS, Baiba Rubesa, resigned shortly before the expiry of her term in September last year, sharply criticizing cooperation among the countries taking part in the project and its management. Rail Baltic is a double track, European standard 1,435 mm gauge electrified railway for passenger and freight transport to be built from Tallinn to the Lithuanian-Polish border. The overall length of the railway will be 870 kilometers.